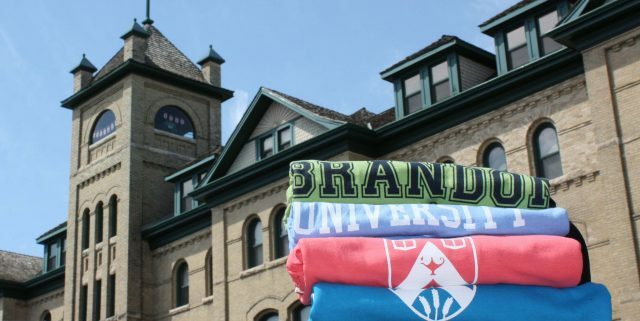 The Brandon University community will be showing off all colours of the rainbow during Pride Week in Brandon, with all staff, faculty and students encouraged to take part in Pride activities. At BU, members of the students’ union and the BU Diversity and Inclusion Advisory Committee will host a decorate-your-own Pride T-shirt activity in the courtyard (weather permitting) on Wednesday, June 13, from 11:30 a.m. to 1:30 p.m. BU students, faculty and staff are invited to decorate their own Pride T-shirt. A limited number of T-shirts and materials for decorating will be provided, or participants can bring their own white or light-coloured shirt to decorate. Popsicle refreshments will also be provided. The students’ union and BU will also be represented at the Brandon Pride rally, march and festival organized for Saturday, June 16, beginning at City Hall at 11:00 a.m. The march, with BU’s Positive Space banner a proud part, will conclude at Stanley Park, where BU and the students’ union will participate in the Pride Festival with face painting, a photo booth and some great giveaways. Other Brandon Pride events through the week are detailed on their web page http://brandonpride.org. Pride Week will kick off with the raising of the rainbow flag at City Hall on Monday, June 11, at 10 a.m.